Could be a useful transition strategy. 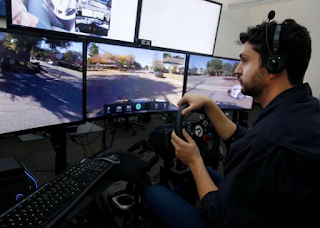 Technology let(s) a remote human driver take over briefly for autonomous vehicles when they get into situations that they can’t handle - edge cases—rare situations that befuddle the vehicles, like very bad weather or unfamiliar obstacles such as a taco truck. (Nissan is doing something similar.) The company’s remote drivers, who get training for the purpose, are meant to take over for short distances—a hundred meters or so to get past an obstacle—so the car can resume operation solo. A car with an empty driver’s seat slowly pulled up in front of me at the MGM Grand Las Vegas the other night. It wasn’t exactly a driverless car, though; my driver was just sitting 540 miles away in Mountain View, California. The car belongs to a startup called Phantom Auto, which is building technology to let a remote human driver take over briefly for autonomous vehicles when they get into situations that they can’t handle. Big tech companies and car makers have invested heavily in perfecting the self-driving car. The vehicles promise less traffic and fewer traffic-related accidents; and, of course, the companies behind them stand to make a lot of money. Such cars are just starting to make their way onto public roads, though, and they still need to get a lot better at many things, like understanding what’s around them and navigating their encounters with other vehicles and people. Phantom Auto thinks it can help speed things along by working on so-called edge cases—rare situations that are likely to befuddle the vehicles, like very bad weather or unfamiliar obstacles such as a taco truck. (It is not alone in this; Nissan is doing something similar.) The company’s remote drivers, who get training for the purpose, are meant to take over for short distances—a hundred meters or so to get past an obstacle, say—so the car can resume operation solo. The far-flung human operators are currently limited to driving at 25 miles per hour. Phantom Auto CEO and cofounder Shai Magzimof says that the company’s technology works by bonding multiple wireless networks—AT&T, Verizon, and T-Mobile, for instance—to create a fast, reliable connection that makes it realistic for someone to operate a car in real time from hundreds of miles away. The company gave me a sense of what this looks like from inside the car. When I hopped in with three Phantom Auto employees in Las Vegas, engineer Ben Shukman, in Mountain View, drove us a couple of blocks.Sitting in his office behind a trio of computer monitors and a gaming rig consisting of a steering wheel and foot pedals, Shukman had the car enter and traverse a busy gas station, then exit and cross a couple of lanes of traffic so that we could proceed straight down the street instead of getting stuck in a right-turn-only lane. At first it was exciting, but Shukman’s slow, hesitant driving started to make me nervous—especially when I looked out the windows at the dark, rainy night and the traffic-filled Las Vegas Strip. He got us back to the MGM Grand’s parking lot safely. But after a car behind us honked impatiently, Magzimof took over the wheel to drive us to the curb. Seems there’s still nothing quite like sitting in the actual driver’s seat.